The Chef Cooperatives and Edible San Antonio have a lot in common – both organizations earnestly support local farmers and spurring the local economy, both were inspired by the local food movement and both were independently founded five years ago. So it was the summer of 2013 that Chef Paprocki invited us all to the very first Chef Cooperatives dinner at Oro, the restaurant at the Emily Morgan Hotel. That farm-to-table dinner, an amazing undertaking, was the first of many well-executed food events. Just 10 chefs were part of the group then: Jeff White, Chris Cook, Toby Soto, Isaac Cantu, Laurent Rea, Melissa Beverage, Alex Altamirano, Tyler Horstmann and Jeret Peña. Fall Creek donated the wine. Like a well-practiced dance troupe, the ten chefs executed seamlessly in the hot, tiny kitchen, producing one exquisite course after another, eight in all. The chefs explained their dishes and talked about the local sources they used. Today, the Chef Cooperatives is a nonprofit comprised of chefs, local food producers, mixologists and generous sponsors from across the food and beverage landscape that unite a few times a year to support individual farmers and worthy local organizations. What started five years ago with a handful of chefs who wanted to support local farmers is now a veritable network of dozens of local culinary professionals who also feel compelled to give back. On Friday, Nov. 9 from 6 p.m. to 10 p.m., the Chef Cooperatives presents Bites for Business to benefit Launch SA, a local nonprofit that helps small businesses. Launch SA is a small business accelerator that supports startups, assists local visionaries and entrepreneurs, and operates Break Fast & Launch (a program specifically for new culinary start-ups.) Anyone with an idea or even a full-fledged local business can access specialty programming, workshops, tailored support and resources. Ryan Salts, the director of Launch SA, also founded Break Fast & Launch Program, the nation’s first culinary business accelerator, which has already helped launch dozens of local food producers, food truck operators and more. Located at Central Library, the programs and one-on-one assistance they offer creates more opportunities local entrepreneurs and positively impacts our local economy. Enjoy a night of Chef Cooperative’s chef-prepared farm-fresh bites to support Launch SA and the important work they do in our community. The evening also includes music, beer and wine from six local brewers and wineries and a terrific silent auction. Tickets, $45, are available online at bit.ly/CCBITES. To learn more about Chef Cooperatives and event updates, visit www.chefcooperatives.com. TUESDAY, OCT. 24 at 7 p.m. This year, foodies will not be asked to suffer the hot summer temperatures to enjoy a culinary gathering of epic proportions. Instead, the Hot Wells Conservancy moved their wonderful culinary festival to Tuesday, Oct. 24 from 7 p.m. to 10 p.m. Guests will also enjoy a change of scenery because the Hot Wells Ruin is currently under construction. This year the event will take place at Mission County Park. The popular food festival serves as a fundraiser for the Hot Wells Conservancy. Last spring, Bexar County officials announced that the Hot Wells County Park would be its first ever cultural historical park on the Mission Reach of the San Antonio River. The nonprofit organization, Hot Wells Conservancy, is tasked with promoting, protecting and providing all the programming at the Hot Wells Ruin. The Hot Wells Harvest Feast started as a collaboration five years ago, when local chef Robbie Nowlin visited Justin Parr’s gardens at Hot Wells. Together, they created an 11-course meal for friends and potential donors which featured food grown on the property. On Oct. 24, organizers anticipate more than 1000 guests will enjoy the local cuisine and libations prepared by some of San Antonio’s most talented, innovative chefs and mixologists at the Fifth Hot Wells Feast at Mission Park. The storied history of Hot Wells includes political leaders and celebs. During the late 1800s and early 1900s, Hot Wells was a spa and resort facility specializing in health and wellness. Built in 1893, the bathing pavilion contained three sulphur pools that were thought to have healing qualities. The luxury site was even a stop on the railroad, to make it easier for the likes of Charlie Chaplain, Teddy Roosevelt and Cecil B. DeMille to visit. The Hot Wells Conservancy nonprofit was established in 2014 to help turn the Hot Wells Ruin into a world-class, national model for urban restoration, revitalization and a means to stimulate the local economy. Plans for the site include education, business, competitive and outdoor recreational activities in a safe and inviting county park for people of all ages. There are even plans for culinary gardens that will teach families how to grow sustainable food. Its rich history will complement the Tri-Centennial celebrations in 2018. Savor small, bite-size portions of creations from over 30 chefs who will be competing for a special gift from Rodriguez Butcher Supply and of course, the ultimate prize … bragging rights for being the chef selected for creating the best dish. Visit bit.ly/HotWells2017 for tickets! Remember to get your tickets now so you won’t be disappointed ~ this one sells out fast. To learn more about Hot Wells, visit www.hotwellsconservancy.org. The generous chefs decided to take their show on the road early last summer to bring attention to and benefit Victoria’s downtown farmers market, a program of the Food Bank of the Golden Crescent, which serves much of South Texas. Now, in the wake of Hurricane Harvey, this support is desperately needed. And even after working so hard at the height of the storm, providing delicious hot meals to the first responders and victims in Victoria, they are more determined than ever to make this benefit happen on Sept. 24, when our neighbors will still need lots of support. The Chef Cooperatives have pooled their creative resources to conceive and execute a knock-out menu with a lot of heart. Guests will enjoy a chef-driven, family-style meal made with fresh, locally sourced ingredients, beer from Alamo Beer, a Michelada option thanks to Madge’s Spicy Bloody Mary Mix, and wine from Kuhlman Cellars and Lost Draw Cellars. “We chose Victoria because it’s the home of one of our chef members, James Canter. We really wanted to do something that would support the local food movement, farmers and other vendors in his community. I think some of these smaller towns often get overlooked, so we’re bringing the party to Victoria this time!” Chef Paprocki explained. Chefs Paprocki, Chris Cook, James Canter, Jeff White, Toby Soto, Adrian Davila, Christina Everett Werley, Iverson Brownell, Michael Grimes and Tatu Herrera, Jenn Riesman, Jenn White and Michael Miller are the Chef Cooperatives members who will be cooking up a storm for this event. The entrees include Coffee-blackened (Waco) Chicken with gingered pear and persimmon compote and grilled poblanos, Figgety Figgety Pork, Y’all, a roast pork with caramelized figs and fig sauce, and chile-citrus chow chow, Burlap-steamed Gulf Oysters with Texas chimichurri mignonette and ginger pear soy rice wine, and Aurelia’s Chorizo. Side dishes include Watermelon Salad with feta, mint and cracked black pepper, Roasted Corn with carne machaca and cotija with charred scallion crema, Green Hatch Chile Potato Au Gratin, Dried Shrimp, Cabbage and Fennel Slaw, Annato Puerro Llapingachos, and Smoked Mushroom, Local Milled Cheese Grits with “Local Yokel” egg yolk dressing. Apple and Pear Pie with burnt honey caramel and Goat Cheese Ice Cream round out the meal on a sweet note. Beverage sponsors include Alamo Beer, Madge’s Spicy Fermented Bloody Mary Mix, Kuhlman Cellars and Lost Draw Cellars. General sponsors include The Chop Shop Produce Co., Aurelia’s Chorizo and Edible San Antonio. Tickets for this great event are $45 per person and can be purchased in advance online at www.chefcooperatives.com/events. To learn more about the Chef Cooperatives, visit www.chefcooperatives.com. For more information about the Victoria’s Farmers Market, visit www.victoriafoodbank.org/farmers-market. CULINARIA RESTAURANT WEEKS THROUGH AUGUST 26! Every year, our calendars are peppered with celebrations. Birthdays, anniversaries, holidays – the list goes on. That list also includes local celebrations and events, days that make one proud to be where they’re from. More and more San Antonians, however, are adding one more celebration to their list: San Antonio Restaurant Weeks. What started as a week of local dining in August to promote the San Antonio culinary scene has now grown into four grand weeks of opportunity throughout the year to support and try out restaurants new and old. More than 100 restaurants will be participating – and the upcoming round of Restaurant Weeks will be particularly special because it also includes the culinary bravado of Boerne and New Braunfels. From Aug. 12 to Aug. 26, patrons can visit a favorite restaurant, enjoy one that they haven’t been to yet or support both. Restaurants offer one of two tiers for pricing options: Tier 1 is a $15 lunch and/or $35 dinner while Tier 2 is a $10 lunch and/or $25 dinner. All must include three courses, but the menu selections are up to the individual restaurants. Local chefs sometimes consider this a great opportunity to introduce new menu items to their menus. It’s not unusual to find that a Restaurant Weeks’ success leads to permanent placement on the menu. In addition to lunch and dinner options, a few restaurants add breakfast to the mix. San Antonio Restaurant Weeks really allows the chefs and restaurants to get creative with their menus and to have fun. The ones who are most successful are the ones who find the balance of adding new and exciting menu items along with staying true to fan favorites. Now, in its eighth year around town, San Antonio Restaurant Weeks continues to expand on the beverage side of dining as well. Restaurants have often added an optional wine or cocktail pairing to the menu. This round, patrons will most likely see a few Chilean wine options as Culinaria partners with another nonprofit, the Wines of Chile, for a bit of cross-promotion. As tasty as every bite of Restaurant Weeks will be, the eating supports the nonprofit Culinaria. The group is currently working on construction of The Farm, an epicenter of culinary education that will feature up-and-coming technology through partnership with MIT. The Farm will feature school tours, seminars and chef-led cooking classes. $1 from each lunch purchased and $2 from each dinner purchased during our Restaurant Weeks is gifted to The Farm. Culinaria also hosts several other large events throughout the year, a 5k Wine & Beer Run in March, the Festival in May, a rosé wine tasting at Becker Vineyards in August and the most exclusive event of the year for Culinaria, Chefs & Cellars at the Culinary Institute of America-San Antonio in September. Plans are in the works for an additional 10k-style event this fall, with more details to be announced soon. Restaurant Weeks is here and the best advice is to make a plan and call ahead for reservations. Culinaria will add the menus from restaurants as they become available and you can find the  list of participating restaurants online at CulinariaSA.org. Restaurant Weeks updates, including photos and last minute additions, are also available through social media at Facebook.com/CulinariaSanAntonio  and on Instagram/Twitter: @CulinariaSA. Rebirth Brass Band will be live at Paper Tiger for a Sunday Funday Party on June 25, but the news for our readers is the shrimp boil that will accompany the show from Pinch Boil House. Co-owners Alex Ho and Sean Wen are all in to present their Southeast Asian seafood and street food experience, a prelude to their brick-and-mortar opening at The Rand at 124 N. Main sometime this summer – and so far, all signs point to an opening in July. In the meantime, the partners will have a shrimp boil pop-up at Paper Tiger (complete with garlic shrimp plates!) alongside the Rebirth show. VIP tickets available at the link below includes frozen drinks, beer, unlimited food and the show for $60 including Pinch’s signature OG Garlic Butter Shrimp Platters complete with local sausage, baby red potatoes and corn. No VIP ticket? No problem! Pinch House will also prepare a $12 platter with a 1/3 lb of shrimp plus sides for hungry people just coming to see the live show. Tickets for Paper Tiger’s SUNDAY FUNDAY are available at bit.ly/PaperTiger0625. Learn more about the new brick-and-mortar and job opportunities at www.pinchboilhouse.com. Farming and ranching, even when implementing sustainable methods, is a tough business. And one of the most difficult barriers to overcome is access to land. Here is the tale of two great farmers at the crossroads, a great community at the ready to ease the transition, and lots of information about the upcoming barn raising. The special link for Edible San Antonio readers to get discounted tickets to the modern barnraising on May 7 is listed below, at the end of the story. In 2008, Mark and Kelly Escobedo of South Texas Heritage Pork didn’t know they were about to embark on a life adventure. But there they were, in a house in Floresville with quite a bit of land, thinking they would raise a pig or two, to make use of the land. Mr. Escobedo was a successful locksmith and ran his own business, then. Mrs. Escobedo thought it might be a good hobby. “It started as a desire to provide some better options for our family. We purchased a pig from a local source,” she explained. By 2010, after reading, learning and scouring the internet for every scrap of information they could find … it came to this. The Escobedos raise Heritage breed pigs – theirs are the Large Black and the Tamworth. They feed them well, they treat them well, and they don’t cut any corners in the process. In the fall of 2014, we stopped by for a visit to the farm and met some of the pigs. And they were fat, healthy, happy and running around. We also met the beautiful dogs that protect them from predators. “Years ago, we didn’t know diddlysquat about what we were doing, now we know diddly,” Mrs. Escobedo said with a smile. Actually, the couple has an encyclopedic knowledge of the industry they adopted as their own. And they’ve risked everything – cashed in the 401Ks, gave up their business, yielded every resource they had, to do this … raise happy, healthy pigs. “We didn’t even have one piece of equipment when we started,” Mr. Escobedo added. “We’re trying to be the best at what we do. When we are gone from this world, this will hopefully mean something, make a difference,” she said. And they are succeeding. This was the first pork farm in Texas with the hard-earned Animal Welfare Approved certification. The Floresville farm spans about 100 acres, all natural. And the pigs graze and live happily off the land. Mr. Escobedo mills their food fresh, every day, food he gets daily from four different sources he handpicked. “Feed is the biggest expense we have … we house-mill everything to ensure there are no GMO grains in there, no hormones or unnecessary antibiotics, ever,” Mr. Escobedo explained. And milling the feed every day is labor intensive, as well. The contraption he put together to mill the grain looks like it came out of a magazine from the 1940s. “It actually did,” he said. Their feed cost is high, not just because it is the best quality, but because they use so much more of it … because they give their animals the time to grow slowly. “That extra time is how they develop flavor,” Mr. Escobedo added. Industrial pork is raised for about 6 to 9 months versus the Escobedo’s 14 to 18 months; industrial pork is confined and fed GMO-grain. South Texas Heritage Pork gets the hand-milled peanut and hay feed. And the difference is dramatically evident. Which is why top chefs in San Antonio like Jason Dady and John Russ buy their pork regularly. And why they sell out at the Pearl Farmers market on Saturdays. South Texas Heritage Pork imay be a bit more expensive – but it’s the Rolls Royce of pork – and it’s raised right here in South Central Texas. It costs more, a lot more, to do it right. All the love, hard work and sheer passion we witnessed in Floresville happens for a multitude of reasons – or maybe, just for one reason. Here’s an important fact – one of the biggest barriers to farming is getting the land to do it on. All this time, the Escobedos have been leasing the land they farm on. They’ve pivoted a few times and moved, but the place in Floresville where they’ve been since 2013? That was supposed to be permanent. When they leased it, they made sure they had the option to buy it. So they acted like it was their own land. They built things and made improvements, purchased several items for the build-out of the commercial kitchen they need to bring more of the processing in-house and to expand their product line. But things change and there’s been some legal wrangling. So whether they get to stay and purchase this land or have to find another farm, they know they need a permanent home on land they own to get the job done. They actually have a house at the farm already, but what they really need is to purchase the land, either the land they have now or another property, add the commercial equipment (a commercial kitchen and curing room), and get it done as soon as possible. One of their long-standing dreams is to create a very special ham, grown in South Texas, fed a custom diet, then cured using their own special techniques. They’ve already named it … Jamon Tejano. “We’ve been working the recipes with various chefs and our own testing and we are now ready. With the permanent location, we can start implementing these ideas,” Mrs. Escobedo explained. When things don’t go according to plan, people have to make choices. The Escobedos are working to purchase their current farm so they won’t have to move and disrupt their happy pigs or lose the investment already made there, and above all, to keep the operation going. They reached the crossroads. Enter the Chef Cooperatives, a nonprofit group of local chefs who use their talents to support local farmers, ranchers and food artisans who need a little push to keep working sustainably, usually by executing a brilliant pop-up event. Since 2013, South Texas Heritage Pork has regularly supported the group, providing pork for many of their events. And every time the chefs offered to help the Escobedos, to get that commercial kitchen going or to finally set up the curing room, they always said no, work with someone who needs it more. So we hope everyone can join us for a modern barn raising from 11 a.m. to 4 p.m. on Sunday, May 7 at Alamo Beer Company, 415 Burnet Street, SATX 78202. You won’t have to hammer even one nail, just come out and enjoy an afternoon of amazing, locally sourced chef-crafted food, beer from Alamo Beer (a la carte) and live entertainment. Compost Queens is also participating to eliminate food waste. They will be providing large bins on wheels in the morning for the chefs’ food prep, and then stay on site during the event to collect the rest. Visit www.chefcooperatives.com to learn about the event and support our local farmers, the local food scene and sustainable farming. To learn more about the farmers, visit www.southtexasheritagepork.com. SPECIAL DISCOUNT FOR EDIBLE SAN ANTONIO READERS: To get your tickets to the Chef Coop’s modern “barnraising” at Alamo Beer this weekend on May 7 at a discount, click here. This quintessential foodie is also a Food Hero at our local Central Market. Ms. Faubert is not professionally trained – she is one of those rare talents with a superior palate and natural skills. You’ll typically find her in a kitchen, whipping up something extraordinary at home for her family or at work. And her tips are always spot-on. Enjoy! Religiously speaking, since St. Patrick’s Day or Lá Fhéile Pádraig falls during Lent, the Church traditionally lifted prohibitions against eating meat. And who wouldn’t want to celebrate the good saint with a little dancing, drinking and feasting to honor the Emerald Isle? I would never turn down what I know as a New England Boil (boiled corned beef with cabbage, carrots and potatoes). But if you want an authentic boil the way it’s done in Ireland, you will need pork, not beef, and said pork will have to be a brined, non-leg joint such as a shoulder. That is a bit much to find around these parts, so want a quick delicious feast that is easily adjusted to serve two or ten? Follow along. This is a moment for me to geek out a bit on Irish food. “Bradán” is Irish for Atlantic salmon, a native fish. It is celebrated in Irish lore, and if you are curious, look into the tale of Fionn MacCumhaill. The tale begins with a salmon that ate some wild hazelnuts, ones that happened to contain all the knowledge of the world. “Biolar” is Irish for watercress, an aquatic plant that grows wild in Ireland. The nutrient-dense super food has pepperiness reminiscent of arugula or a mild radish. Story-wise, it’s an old folklore remedy for lunacy, a 16th century cure for scurvy and connected to the long life of St. Brendan. We cannot avoid the non-native potato. Was it Sir Walter Raleigh that brought the spud ashore or did it wash up from a wrecked Spanish ship? Either way, it became a staple in all its delightful, fluffy ways. If you’ve never had champ, it is a must for the kids like me that loved mixing the mashed potatoes on their plate with whatever was next to it. Typically, the potatoes are mashed with boiled milk, mixed with a varying selection of vegetables (crispy onions, dulse, kale, peas, leeks, et cetera) and studded with delicious little lumps of melting butter. Champ, too, has it’s own story and schoolyard songs. Notice a trend of food and stories? I think most of us can relate, Irish or not. This St. Patrick’s Day, try these recipes for salmon and champ or discover your own island fare from fair Ireland. Sláinte chugaibh ~ cheers y’all! Place the potatoes in a pot large enough to accommodate them and cover with water. Cover and bring to a boil. Reduce heat to simmer before it boils over. Cook until they are tender and then drain. If using Russet, place them on a cutting board or dish until they are cool enough to handle. The skin will peel pretty easily. For Yukon Gold, do the same or leave the skin on. Use the same pot the potatoes were boiled in to heat the milk to a simmer. Mash the potatoes with the milk, adding some more milk if needed. Season with salt and pepper to taste. Stir in the chopped watercress. Push in bits of the butter through out so they melt into little pools of yum! Line a sheet pan with parchment paper and place the salmon on top, skin side down. Rub with a splash of whiskey to moisten, then season with salt & pepper. Allow the salmon to rest on the counter for a good bit so it is not ice cold when you cook it. Turn on the oven broiler. When the oven is hot, place the salmon on the middle rack of the oven, cook for about 10 minutes per inch-thickness of fish. If the thickest part of the fillet is half an inch or so, it only needs to cook about 5 minutes. Remove from the oven and set aside. In a small saucepan, stir the cream and mustard together and bring to a simmer. When it begins to thicken, remove from the heat and season to taste. Plate the salmon, sprinkle with the fresh chopped herbs. Serve the sauce on the side or drizzle it over the salmon. Enjoy! Chef Johnny Hernandez unveiled the name of his newest restaurant concepts and even shared a little taste at the official opening of The Flats at Big Tex in November. Get ready for Villa Rica, which will serve Mexican seafood, and Burgerteca, a Mexico inspired burger restaurant, to open in the retail space of the new community in early 2017. The new complex resides on the site of the former Big Tex Industrial Complex, a regional agricultural processing hub that operated between 1917 and 1952. In 2008, the complex and the main grain elevator building were determined eligible for inclusion in the National Register of Historic Places. The chef’s enormous new Southtown space, currently being built out, sits right on the river with terrific outdoor patios. It will also be the first thing you see as you enter the brand new 336-unit apartment community. The Flats at Big Tex was developed by The NRP Group, which also recently announced plans to build the first apartment building in the $300 million Lone Star Brewery project. Big Tex offers a variety of floor plans for each of its studio, one, two and three-bedroom apartments. The new multi-use development resides on 7.5 acres of river front property with direct access to the River Walk, adds 6,400 square feet of ground floor retail space to the area, and has a gated multi-level parking garage. And the apartments and townhomes are just steps away from the Blue Star Arts Complex’ galleries, restaurants and shops. City officials, Bexar County Judge Nelson Wolff, Dan Markson and Debra Ann Guerrero from The NRP Group, downtown housing pioneer James Lifshutz, who also developed the Blue Star Arts Complex, and Chef Hernandez were on hand to celebrate the grand opening of Big Tex, which already has tenants. According to a release, the city agreed to provide nearly $5 million in incentives for the project including a 15-year abatement/rebate on city property taxes, city fee waivers, SAWS impact fee waivers and an Inner City Incentive Fund Grant. Bexar County also assisted with a 10-year, 40 percent abatement of County Ad Valorem taxes, with an estimated value of $485,747. Chef Hernandez remembered when Dan Markson showed him the sketches five years ago. “Dan had this beautiful corner where he wanted a grand entrance and he felt a restaurant belonged there,” Chef Hernandez explained. The space, which is right on the river, is huge. So to make the model work and manage costs, the chef proposed two concepts he always wanted to bring to SA. The first, Villa Rica, is a Mexican seafood concept. The second concept, Burgerteca, will feature burgers that spotlight the different regional flavors of Mexico. The chef also plans to serve shaved ice and paletas, with all the ice cream and syrups made in-house. “What will make it iconic are the silos. We hope to install a bar so Burgerteca will have this inventive, cool, funky silo bar,” Chef Hernandez added. Those on a quest for the perfect cup ’o joe might consider attending this weekend’s San Antonio Coffee Festival, which is sure to help blaze that trail. What better way to kick off the new year than to find your new favorite brew? The San Antonio Coffee Festival returns to La Villita this Saturday, Jan. 7, from 10 a.m. to 5 p.m. The celebration presents an excellent opportunity for caffeine connoisseurs to sample coffees from around the world – many expertly brewed by local artisans. San Antonio Coffee Festival founder and organizer Linda Brewster, whose apropos surname comes from her husband’s family, explained that the Coffee Festival, a labor of love, offers free admission to everyone … and guests are welcome to enjoy the free presentations that cover subjects from latte art to coffee cocktails and more. As for coffee tastings, visitors can purchase $5 tickets for the festival’s special tasting flights. Local and international roasters will be attendance – more than 45 different coffees are expected for this year’s Coffee Festival. The San Antonio Coffee Festival’s approach to celebrating the cherished beverage is modeled after the method that professional brewers often employ to categorize their creations. According to Mrs. Brewster, the “Tasting Flight” concept is an informal version of a traditional “coffee cupping” — the method a professional coffee taster uses to measure aspects of the coffee’s aroma and taste, specifically the body, flavor, acidity and sweetness — similar to how sommeliers evaluate wines. Mrs. Brewster, who earned a Golden Cup Brewing Technician Certification from the Specialty Coffee Association of America in May 2011, waxed philosophical about coffee’s role in society. And she has plenty of experience to draw from. Mrs. Brewster traveled the world to expand her knowledge of everything coffee, jet-setting to coffee-growing hotspots like Antigua, Guatemala, Honduras, Kenya, Tanzania and Hawaii. A jaunt throughout Europe was a veritable education that added an array of local brewing techniques to her repertoire and extended visits to Los Angeles and New York City allowed her to immerse herself in some of the country’s most vibrant coffee scenes. “The culture of coffee is so interesting — everyone has a different way of brewing and serving it. Also, the science of coffee, farming, processing, the many hands that carry the bean from crop to cup, the economics of coffee, the history of coffee, the health effects of coffee. There are so many fabulous coffee-related topics to talk about,” Mrs. Brewster gushed. While many San Antonians buy their coffee from big franchises like Starbucks and Dunkin’ Donuts, the city has quietly cultivated a highbrow coffee scene that caters to more discerning drinkers. In 2015, Alton Brown famously declared that Brown Coffee served him the best cup of coffee he had ever tasted, while other popular local competitors like Rosella, Local Coffee, Fairview, Sabina’s and Summer Moon have their own share of devotees. It turns out coffee might even be good for you. The World Health Organization said in a report released last year that drinking coffee may lower the risk of developing specific cancers. The National Coffee Association cites a Harvard study that suggests coffee drinkers live longer. They also found that coffee consumption is on the rise nationwide and coffee drinkers are increasingly willing to part with a few dollars in return for an expertly brewed cup. Millennials interest in coffee has surged over the last decade, which saw the number of twenty-something-aged coffee drinkers double. Whereas drip coffee makers used to be the norm, younger drinkers have shown a decided preference for so-called “gourmet coffee beverages,” a category that includes espresso-based beverages and iced or frozen drinks. They are also most likely to purchase coffee from a company or brand that they trust, valuing organic ingredients, environmental conscientiousness and cultural cachet. According to Mrs. Brewster, the coffee culture has taken hold in the Alamo City, and for adults of all ages. There’s no question about it … from latte throw downs to trendy flavors and concentrated cold brews, San Antonio’s star on the coffee scene is on the rise. AN AUTUMN POP-UP FEAST AT GARDOPIA GARDEN! The Chef Cooperatives will host a feast, “ThanksGIVING!,” for the benefit of Gardopia Garden, from 4 p.m. – 6 p.m. on Saturday, Nov. 19 at the growing urban farm at 611 N. New Braunfels and all proceeds will benefit Gardopia. The chef-driven multi-course feast includes goat, rabbit and turkey, scratch-made ice cream and pastries … all paired with local craft beer and Texas wines. Dirty Genez will provide music. Tickets are $55 online (bit.ly/GARDOPIA) or at the door the day of the event. Edible readers should enter promo code Gardopia at checkout for a $5 discount. Gardopia founder Stephen Lucke officially established the little urban farm on a plot of land at the corner of Nolan Street and North New Braunfels Avenue and activated a Kickstarter campaign to help fund a wellness center at the garden. The Kickstarter campaign failed to bring in the needed cash, but caught Chef Cooperatives President Stephen Paprocki’s attention. “The most pressing matter is to purchase the property on Nolan St. at a fair value to preserve the garden and wellness center for the Eastside,” Mr. Lucke explained. Chef Paprocki reached out to Mr. Lucke to see if the Chef Coop could help. Mr. Lucke jumped at the chance. Chef Paprocki understood right away that the garden provided a way to reach disadvantaged students and to teach everyone in the neighborhood how to grow produce on a farm. He explained that the chefs are preparing for about 200 people to attend. Gardopia is much more than a garden, it provides neighborhood residents and children with a gardening program that teaches life skills. Mr. Lucke hopes Gardopia will grow its membership to 100 in its second year to support garden-based learning at schools and the wellness program at the Nolan St. location. The Chef Coop hosts dinners throughout San Antonio. Last spring, a sold-out popup dinner at My Father’s Farm in Seguin raised money for Green Spaces Alliance. The group has raised more than $150,000 in three years for local charities, farmers and other 501(c)3 organizations. Stephen Lucke, founder of Gardopia Garden, on a recent Saturday workday at the urban farm on San Antonio’s Eastside. In 2012, then the University of Incarnate Word (UIW) senior Stephen Lucke started an edible garden to serve the school community. As a student employee of the UIW grounds de- partment, that wasn’t exactly in his job description, but the young man had a vision. And as the biochemistry major’s garden grew, so did its purpose. Workdays at UIW’s edible garden evolved into community service hours for students and discussions about promoting campus sustain- ability, fresh food and education. By the time Mr. Lucke graduated in December 2012, he realized the impact a community garden could have, particularly if it was used for education as well as produce. “Gardening has so many positive impacts. In my own case, I didn’t eat many vegetables until I had a reason. When I started the garden in 2012, I had great success with Roma tomatoes. There were so many, I started to eat them. Even on a very small scale, gardening expanded my palate,” Mr. Lucke said. As he learned more about the problems that face San Antonio, his ideas about gardening as a panacea of sorts also grew. “Poverty and obesity is like a modern day plague in San Antonio,” Mr. Lucke, now 27 years old, said. Mr. Lucke started helping with community and school gardens on the Eastside and found the plot of land at 611 N. New Braunfels and Gardopia Gardens was born. The physical garden, more of an urban farm complete with chickens, is located in a high-crime area. The growing urban farm at 611 N. New Braunfels on the Eastside. The nonprofit is a wellness program with three pillars: education, health and environment. The group received an Eastside Promise Zone grant for $10,000 to support the health portion of Gardopia. This grant was used to pay coaches and buy exercise equipment need- ed for the Gardopia program to work with several SAISD schools. The basic premise of the health and wellness based nonprofit orga- nization is to help everyone practice wellness in their daily lives. “We define wellness as a holistic approach to being healthy. So our vision is to make sure there are gardens everywhere with fresh organic produce. In the garden, we exercise repetition and demonstrate how everything is full circle,” he added. At Gardopia, everything is done organically and sustainably. They make and use compost and implement rainwater collection. Right now, kale, tomatoes and cucumbers are growing in the garden. Soon they’ll be putting in broccoli, cauliflower and cabbage. Chef Michael Sohocki’s column below made it into the top 5 for a 2016 Eddy Award! which was recognized thanks to your interaction with it and participation in the voting. If you’re looking for ways to spice up your holiday dinner, Texas-based Mexican food company Mölli has some exciting recipes to give your traditional Thanksgiving meal some delicious twists. Although they don’t celebrate Thanksgiving in Mexico, they do make a traditional turkey dinner for Christmas in many parts of central Mexico, including Oaxaca. They often stuff the turkey with oranges and brine it for 24 hours to make it super juicy. Founder Rodrigo Salas used one of his popular Mölli marinades called Oaxaca to make an adobo-rubbed stuffed turkey with all the authentic flavors of Mexico that still feels like home. Mr. Salas also turned the classic American stuffing on its ear by using bean tamales along with the Mölli Veracruz Cooking Sauce (recipe below) to create a savory alternative. “What we normally hear from people is that they always make the same thing. A lot of our friends asked us what they could do with the sauces for the holidays, so that’s how we started experimenting. One of the things we love about these recipes is what you can do with the leftovers. The turkey makes a great torta. We put it on a baguette with avocado, tomatoes, onions, beans and mayo,” Mr. Salas said. The company offers a variety of sauces and marinades that are extremely versatile and made with fresh ingredients minus the ubiquitous preservatives and fillers. Mr. Salas is also developing new products, such as a habanero sauce, a marinade made with beer and a chili powder. More recipes for an incredible and unique holiday dinner can be found on the Mölli website at mollisauces.com. Look for dishes such as easy green beans with bacon and chipotle sauce, spicy mashed potatoes and cauliflower, and a sweet spicy cranberry sauce. Mölli sauces and marinades can be found at Central Market in San Antonio and throughout Texas. Online purchases can be made at artizone.com. 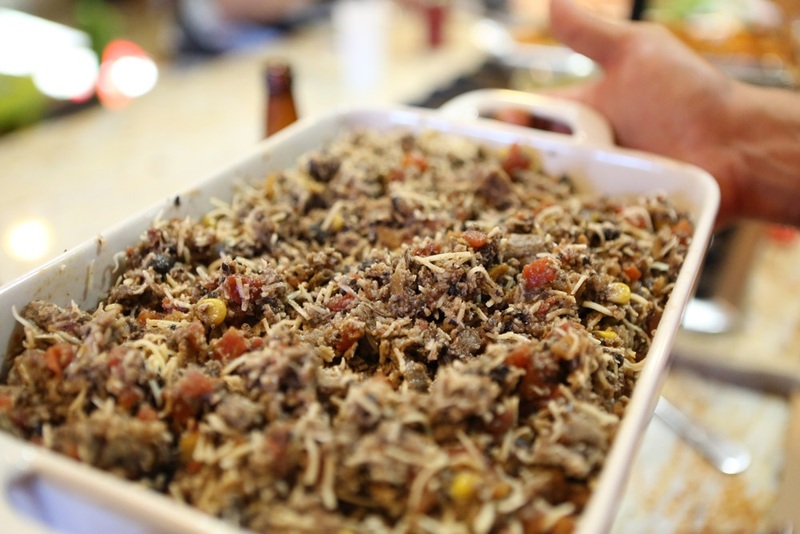 RECIPE: Incredible Tamale Stuffing for Thanksgiving! Preheat oven to 350 F degrees. Reheat tamales according to package instructions and remove husks. In a large bowl, combine all ingredients. Use a slotted spoon or fork to crumble the tamales and really combine everything. Pour mixture into a greased baking pan and bake for 20-30 minutes. Provecho! Enjoy a Texas taste explosion at Tango of the Vines on Nov. 6! More than the world’s greatest virtuoso cellist, Yo-Yo Ma is truly a virtuoso human being. He is a generous soul on an extraordinary quest, seeking answers to profound questions and making the connections to share with all of us. In fact, I’m sure he said the most important part of a performance is “sharing something.” But the words that reached my heart came a few minutes later. “When you don’t share, you’re spending lots of energy keeping it – but when you share, it’s as if you’ve created a muscle, and it builds more capacity,” he said. In just a few minutes, it was clear that when Mr. Ma looks at something, he sees, and he’s mastered the elusive talent of knowing the right questions to ask. On his last visit to San Antonio, Mr. Ma performed with the The Silk Road Ensemble. I wondered what one thing spurred him to create the magnificent collaboration between musicians as far flung as China and Galicia, uniting the sounds of different cultures and traditions into glorious joyful song. But Mr. Ma was not weaving a wild tapestry of music. The common thread, the piece that joins the musicians, comes from a somewhat distant past when these cultures did brush against each other along the Silk Road. The historical link is significant, because it connects us as well to a distant ancient past that lies buried within. The story of the Silk Road is as rich as the commerce that made it grow and connected the east to the west, commingling flavors, colors and sounds serendipitously that had never been mixed before. And for hundreds of years, not only exchanging goods like silks and spices, but ideas, traditions and culture. The very important questions often take time to ponder and nurture, and this grand experiment connecting humans, those who play as well as those who listen, through music, deserved all the time in the world. And The Silk Road Project finally came together as a nonprofit organization in 1998, opening minds and hearts to the echoes of cultural exchange from the past to envision new connections. “Well, I was born in Paris to Chinese parents and we moved to New York City when I was about four or five,” Mr. Ma said, to explain away the quirk of taking his time to consider something. And indeed, Mr. Ma has recorded more than 90 records in about 35 years and earned at least 18 Grammys in diverse categories, including separate best crossover awards for playing the tango, and bluegrass and Latin music on an album called Obrigado Brazil. His ability to stretch musically not only led him to create The Silk Road Ensemble, but also to play with Santana, James Taylor, and Sting, just to give a small sample. For Mr. Ma, music is a universal language, not just a classification on a chart. It wasn’t until he played with Bobby McFerrin, however, that he learned what he considers the most important performance lesson of his life. “He is fearless, and his message was ‘be yourself,’” Mr. Ma said. He loves live performances above all. And Mr. Ma has had magical moments – in 1962, just 7 years old, he played for Presidents Kennedy and Eisenhower (with his sister Yeou-Cheng Ma). As he became more and more accomplished on the cello, he traveled all over the world, recorded and played with hundreds of artists. Among his many accolades, he is the U.N. Messenger of Peace and received the National Medal of Arts in 2001. In 2010, he was awarded the Presidential Medal of Freedom, the highest national honor that can be bestowed on a civilian. The other honorees included former President George H.W. Bush, Maya Angelou, Sylvia Mendez and 11 other great thinkers, scientists, leaders. Mr. Ma observed that the honorees were all lovely people, people who were intensely aware of others. “Awareness is part of being, and a way to get a sense of who we are,” he added. On October 16, we have a great opportunity to become more aware, but the upcoming performance with Director Lessing and the San Antonio Symphony at the Tobin Center is for one night only. “Mr. Ma will play the Cello Concerto in B minor, the last solo concerto composed by Antonín Dvořák. We will also play Rachmaninoff’s Symphonic Dances – both pieces were written in America,” Music Director Sebastian Lang-Lessing explained. Connections abound now as they did the last time he visited San Antonio. Mr. Ma added he has real connections here as well. “My father-in-law was born in San Antonio,” he explained. Mr. Ma is married to the lovely Jill Hornor and they have two grown children, Emily and Nicholas. But that’s not all. It turns out he is related to Eva Longoria. “A genealogical study discovered Eva Longoria and I share a relative somewhere in the last one hundred years. Really,” he said. And while I broke it to him gently that that did not qualify him to be a Mexican, I remembered, thanks to John Phillip Santos and his beautiful book, “The Farthest Home Is in an Empire of Fire,” that in fact, we are all Mestizos. And for Yo-Yo Ma, that connection was a joy. To purchase tickets for the concert, visit tobincenter.org. Mr. Ma’s latest album, “Songs from the Arc of Life,” with pianist Kathryn Stott, was released in September 2015. The busiest man in cocktails is starting his fourth venture and first food concept with Old Main. Jeret Peña was busy putting on a fire sale for perfectly good furniture and hip fixtures from the former Beat Street Coffee Co. Bistro. Mr. Peña envisions the space as a convivial grazing spot/watering hole, a neighborhood spot with beer, wine, a small cocktail menu and pub grub. But with partner Lorenzo Morales in charge of the menu, it won’t be standard grub. Pork-n-beans with braised pork shoulder and spicy white beans, fried chicken with mole, a burger with a bun of pan de huevo and a pecan aioli sauce … Chef Morales, formerly of the Arcade and Tuk Tuk, is extremely excited about marrying a modern food sensibility with the flavors and ingredients of his grandmother’s kitchen. Old Main will join Barbaro on McCullough in providing a Midtown neighborhood spot that offers contemporary fare and cocktails at a moderate price. Mr. Peña doesn’t see it as a competitor to the Monte Vista pizza-and-small-plates venue, but as a complement that shores up the area’s offerings. After winning accolades and national attention at The Brooklynite and The Last Word, Mr. Peña’s partnership, the Boulevardier Group, wanted to do something that could line the stomach as well as lift the spirits. The trick was finding the right space. When the opportunity arose, the site helped shape the plan. Update: The Old Main Assoc. will open at the end of August! We’ll report the exact date as soon as we know! Salud! Culinary Night events at the Witte Museum embrace avant-garde presentations with chef demos and informative discussions that offer unique insights — unlike any other dinner series in San Antonio — as the upcoming “Bug Dinner” on August 12 demonstrates. Chef Stephen Paprocki, founder of Texas Black Gold Garlic, and Pastry Chef Ernest Lopez from Hotel Éilan will create a special dinner to showcase the edible possibilities with a variety of insects. According to the chef, eating bugs is nothing new. “Bugs have always been there for us as an alternative form of protein and are a great resource for fighting world hunger,” he explained. He likened edible bugs to sushi in the early 80s when the trend first appeared on American menus. “People were freaking out. ‘I’m not gonna eat raw fish,’ but today, it’s completely mainstream,” he said. Meghan Curry, founder of Bug Vivant, an educational website about edible insects with recipes, agrees. She doesn’t think eating insects is a fad. “The demand for animal protein is growing, but the amount of land and water necessary to produce it [enough to meet the growing demand] isn’t there. Insects are a great alternative because they require much less water, have a shorter generation time and can thrive in crowded conditions,” Ms. Curry explained. During the dinner, Ms. Curry will discuss how insects are being used in kitchens across the globe, as well as their value as a sustainable food source. With an anticipated world population of 9 billion by 2015, entrepreneurs like Ms. Curry are working hard to develop viable options to meet the ever-increasing need. Her company’s main mission is to encourage Americans to adopt eating insects to help leverage limited resources. Ms. Curry believes if American chefs are able to turn bugs into delicious cuisine, we may be on the verge of a new culinary trend. To complete the program, Dr. Harry Shafer, curator of archaeology at the Witte Museum, will explain how insects played an integral role in the Pecos people’s hunter-gatherer way of life. The three course dinner includes a young spinach salad with goat milk ricotta, roasted beets and a mixed “Caviar” of Hymenopteran larvae with balsamic vinaigrette; a twist on the classic French flatbread pissaladière (made with mealworm) and topped with Texas goat cheese, Texas Black Gold Garlic, local olive and truffle oils; and a chocolate cricket crémeux with fire ant spicy tamarind sorbet. Each menu item will be paired with beer from Karbach Brewery. “We’re just scratching the surface. There’s so much we can do with bugs – it’s so fun to put in the hands of chefs like Stephen (Paprocki). There’s a huge new range of food we get to play with, it’s exciting to see what they come up with,” Ms. Curry added. Chef Jeff White: From Fry Cook to Top Chef! At the Pearl, Chef Jeff White stands just outside the doors of The Boiler House. Step into the Boiler House these days and peek into the kitchen. Chances are you’ll see Executive Chef Jeff White working shoulder to shoulder with his staff. Easygoing and friendly, the 41-year-old chef said his pet peeve is a messy kitchen. “Sloppy decks mean sloppy thinking. Everything just moves a lot more smoothly when everybody cleans up as they go along,” Chef White said. Making sure things move smoothly is a major consideration in a kitchen that turns out about 600 covers on a weekend night. Chef White gravitated to the culinary arts as soon as he could start working “officially” at age 15. He began his career at Tom’s Ribs on Nacogdoches Road … washing pots. He worked his way through high school in that kitchen, cleaning dishes, bussing tables and chopping vegetables. “All the cool guys there were cooking, so I really wanted to be on the line, too,” he said. He finally got the chance just shy of turning 18 — as a fry cook. When he graduated from high school, managers at Tom’s ceremoniously offered him a job in the kitchen for $4.75 an hour. “So I went to college,” he said. Chef White did not study culinary arts, though. Instead, he delved into mechanical engineering at Texas State Technical College. “I was married, with a baby, and I needed a real job. So I went to work at Palmer’s in San Marcos and landed a job as a line cook. Having a full-time job and being a full-time student was very tough with a young family,” he said. Somehow, he managed. Even before graduating, the San Antonio native became executive chef at the upscale Hill Country restaurant and worked there three years. Chef White thrives in his kitchen at The Boiler House. “As a line cook, I got the chance to create a few specials and they named me exec chef, but I didn’t know a thing about running a kitchen and relied on accounting majors and lots of other people to show me how to do this and how to do that. They never really knew what I didn’t know, I don’t think,” he said. “I just couldn’t pay attention — I was always thinking about food,” he adds. After college, he took a job drafting for a construction company, but was always thinking up new dishes, creating joy in the kitchen. Since then, working 10 to 17 hours a day is part of his routine. Chef White said he wouldn’t have it any other way, and his family life is interwoven with his vocation. “Finding a balance between personal and work life is always tricky, but no matter how hard you work or how tired you are, you find a way to make time, even if they (relatives) have to come to the restaurant to celebrate a special occasion,” he said. His daughter, Kaileigh, now 18, is at the Navy boot camp on the Great Lakes in Michigan. And this time he’ll be going to celebrate with her. “I get to go see her graduate in Chicago next month,” he said. But there was a point in his career when taking time off wasn’t in the game plan. On his quest to become a great chef, he sought the best and most reputable masters to help hone his skills. He received a warm welcome into the kitchens of some of the area’s most acclaimed restaurants: from Louis 106 in Austin and L’Etoile in San Antonio to Chef Bruce Auden’s Biga on the Banks, the Westin Riverwalk, Restaurant Acenar and the Grey Moss Inn. The idea of buying fresh and local made the biggest impression. “Bruce used lots of locally sourced ingredients and I learned how imperative it is to buy local and be connected to where your food comes from,” Chef White said. By 2008, less than 10 years after officially switching careers, Chef White was appointed executive and corporate chef for the Columbia Culinary Team. An opportunity to work with Chef Johnny Hernandez at True Flavors Catering beckoned three years later and during 2012 he was invited to help open The Boiler House at the Pearl. Just a year later, he became executive chef. He’s accumulated accolades and awards, including First Place in the San Antonio Herb Fair in 2003 and The People’s Choice Bronze Award for Taste of Elegance in 2005. Chef White was also an American Culinary Federation Guest Chef at the James Beard House in New York City. In his relatively new role at The Boiler House, Chef White creates marvelous menus and fosters a collaborative atmosphere. Chef White presents his charcuterire plate at the very first Chef Cooperatives dinner at the Emily Morgan Hotel in August 2013. “I‘ve been in almost every role in many kitchens and I got to see and practice many management styles. Where I feel most comfortable is as a mentor — in my kitchen we all work together. I learned the best way to manage is by example. I wouldn’t ask anybody to do anything I wouldn’t do and I don’t like to see idle hands,” he said. Chef White especially enjoys preparing charcuterie, the art of cooking, curing and preserving meats, pâtés, foie gras and confits. “Making prosciutto from scratch, creating mortadella from sweetbread and lamb tongue or pastrami from duck breast takes time and plenty of labor, but the specialized techniques are wonderful. Learning to use the kidneys, the heart, the feet parts of the animal, parts of an animal that are all delicious and underutilized today, is essential in my book,” Chef White said. Many of the chef’s techniques are rooted in centuries-old traditions and methods that use the whole animal. “You’re not wasting any part of the animal that died — that shows respect for the farmer and the animal,” he said. “When creating a plate, we reach for a balance of flavors of textures. It’s easy to get lost in the technique and forget the goal — but the idea is to present the cured meats in their most natural state to preserve the flavor and quality — and it’s important to stick with the old-and-tested traditional methods to achieve the best results,” he added. While the meat-centric Boiler House serves up charcuterie, mouth-watering steaks, grilled skewers and even game, the restaurant also offers plenty of salads and vegetables — almost all of it from local farms. And on the weekends, Chef White often walks around the Pearl Farmers Market just outside the restaurant’s door and buys fresh produce directly from the farmers. “Working at Biga on the Banks opened my eyes to this concept. You can develop a personal relationship with the people you buy from – you know where your food comes from, how they grow it, sometimes you even get to see the places it comes from,” he said. That’s a good thing, too, because by necessity, whatever they choose to cook at the restaurant has to be fresh. Chef White explained the thing he loves most about his work is the sense of community among the food professionals in San Antonio. He is a member of a new chefs group, the Chef Cooperatives, with a mission to support area farmers through special events and locally sourcing menus as much as possible. “I love the chef community here — we support each other and each other’s restaurants; we promote each other. Our camaraderie allows us to experiment and elevate the food scene here for everyone in the city, and everyone contributes to make it happen,” Chef White said. Perfect for any gathering, this dip recipe comes from San Antonio chef Chuck Hernandez, who will soon be opening a farm to fork restaurant in the city. 1. Using a food processor, gently pulse ingredients until they are thoroughly combined. 2. Scrape sides down with a rubber spatula, approximately 1 minute. 3. Serve or refrigerate in an airtight container, up to 4 days. Best served with poultry or other white game meats, warm or baked cheeses, toasts, crackers, fresh apples, pears or as a sandwich condiment. Recipe reprinted with permission from “Pesto Power, An Exploration of International Sauces as Condiments” by Chef Chuck Hernandez, 2013. Visit www.arugulacatering.com/book for more information about this local cookbook. Nutritional information per serving (approximately): 1,701 calories; 31 grams carbohydrates; 166 grams fat; 140 grams protein; 1,539 milligrams sodium; 9 grams sugar. Happy New Year, San Antonio! Back by popular demand ~ our favorite dish to ring in the New Year! The Salad: Lucky Black-eyed Pea Salad from the kitchen of Paula Nottingham. Prepare peas according to package directions, simmering only until tender but firm; drain and let cool for one hour. Whisk together cilantro and next 6 ingredients in a large bowl. Stir peaches and watercress into pea mixture just before serving. protein; 1,192 milligrams sodium; 5 grams sugar. The potato pancake is a delicious hallmark of the Hanukkah celebration – but the honor has little to do with the fact that latkes are made from potatoes. The Festival of Lights, which starts at sunset on Dec. 16 this year, celebrates all fried foods to commemorate the miracle of a little bottle of olive oil. Sometime before 165 BC, the Greek king of Syria, Antiochus, banned all Jewish practices and forced the people to accept and worship Greek Gods. His soldiers desecrated the Temple in Jerusalem, and finally, a small band of Jewish rebels, the Maccabees, fought back. And they won. The people cleaned and restored the Temple, but to rededicate the Temple, they needed to light the Menorah, which was supposed to burn all night, every night. It took eight days to make the oil for the Menorah, but all they had was one little bottle, just enough for one day. They lit the Menorah anyway, and miraculously, the oil lasted for eight days. Those in charge declared an eight-day festival to celebrate the miraculous oil. So Hanukkah is a happy holiday because it celebrates a triumph – not the military one, but the triumph of a little bottle of oil that lit up the Temple for 8 days more than 2000 years ago. Today’s latkes are still fried, of course, but for Di-Anna Arias, Vice President of Sales & Culinary Vision for Don Strange of Texas, the delicious pancakes pack a ton of culinary potential. She notes latkes weren’t always made from potatoes. People made latkes from whatever was seasonally available, so today’s creative latke dishes are actually a throwback to ancient times. Ms. Arias said she’s experimented with sweet potato, cauliflower, broccoli, guacamole, cheese and even tuna. “Latkes are so delicious. We eat them year round. They can be prepared in so many different ways. And simple variations make a big impact,” she said. The classic potato pancake, made with grated potatoes, onions and eggs, is traditionally served with applesauce, but latkes can also be topped with sweet or savory condiments, served as a side dish or even a dessert. Ms. Arias also suggests making them in different sizes for different purposes. Ms. Arias also recently developed a recipe for a root vegetable latke. “It’s a take off of the classic latke, but we use root vegetables like parsnip, golden beet, sweet potato and carrot. And we serve it topped with Don Strange cranberry and pecan chutney,” Ms. Arias said. She uses a little kitchen magic to make the root vegetable latkes a success every time. “The trick is to roast the vegetables first – for about 25 minutes at 375 degrees — so they caramelize a little. Then just follow the recipe for the classic potato latkes, using the root vegetables instead of potatoes,” she said. Ms. Arias also created several versions of a “Latke Benedict,” which demonstrates the versatility of the potato pancake. Instead of bread, the latke takes over as the base with a poached egg and artichoke hollandaise sauce on top. She also suggests adding smoked salmon and crème fraîche for a delectable departure from the classic. “We’ve even featured latkes made with parsnips and sweet potatoes (parsnips add a great flavor) and topped them with roasted figs, ricotta and honey. There are no limits to the flavor combinations you can create,” she added. Go ahead. Create your own classic. And remember latkes are just as delightful straight from the pan. Enjoy! Using food processor with a coarse grating disc, grate the potatoes and onion. Transfer mixture to a strainer and using a paper towel on your hands, squeeze out as much liquid as possible. Working quickly so mixture will not discolor, add the eggs, flour, salt, pepper and baking powder and mix until flour is absorbed. Heat a medium sized heavy-bottomed skillet over medium to high heat, and pour in about 1⁄4 inch of the oil. Once the oil is hot, drop a heaping tablespoon of batter into the hot pan. Use a spatula to shape into rounds. When the edges are brown and crispy, flip. Cook the second side until golden brown, about five minutes. Continue cooking latkes in batches, adding more oil as necessary. Transfer the latkes to a plate lined with a paper towel and sprinkle with kosher salt. Use 2 Tablespoons of Classic Potato Latke batter to add to the hot oil. Flatten latke in pan to make a 3 inch round. Add sliced smoked salmon and shaved artichoke heart. Top with a perfectly poached egg and Hollandaise sauce. Let’s drink up some knowledge. October 12, 1810 was the royal event of the year, when all citizens of Munich, Germany attended the wedding of Bavarian Crown Prince Ludwig (later to become King Ludwig I) and his bride, Princess Therese of Saxony-Hildburghausen, on the fields in front of the city gates. The fields were named “Theresienwiese” (“Theresa’s fields”) in honor of the Crown Princess, and for more than 200 years, their anniversary is celebrated with the tradition called Oktoberfest. Today, Oktoberfest celebrations feature large quantities of pumpkin-spiced beer, but behind that is the fascinating geologic process of making the beer and wine used to celebrate with each year. Hops: The Geologic Ingredient Hops, the flower of the common hop plant (Humulus lupulus L.), is best known for its use to flavor beers. It is a female plant species that grows as a vine and is native to temperate regions of the northern hemisphere, such as North America, Europe, and western Asia. There are many varieties of hops, which are used in the flavoring process of brewing beer. Each variety, grown in various areas, provides a different accent of flavor, contributing to the different flavors for each brand of beer. Other factors that can affect flavor are ingredients, such as barley and wheat, and the different brewing techniques. Hops are a species of vine, whose flowers are used in the beer-brewing process. It provides flavor to beer, and has several varieties. This variety is called Cascade. As hops plays an important role in the flavor profiles of beer, the alcohol and viscosity (thickness) are a function of other ingredients such as initial sugar content, which is then fermented by yeast into alcohol. The Cascade variety of hops can grow to be extremely large and provide a great harvest and flavor for nearby breweries. Each type of hops requires different soil conditions, but hops in general share some broad requirements.The soil must be crumbly and well drained with low soil acidity. Hops also require access to a lot of water, so the presence of surface water is extremely beneficial. In addition to its geologic mapping, soil geochemistry, and national streamgage network USGS, tracks flood and drought conditions that can significantly affect the growth of hops. Geology Makes a Fine Wine It’s not just hops that rely on geology, not all grapes are ideal for wine-making. In fact, the soil, geology, and climate combine to make the difference between low-value table grapes and delicious wine. Most winemakers will say that nature and the Earth are as important as people in making the best wine. Unlike hops, though, cultivators need to be concerned about giving grapes too many nutrients. In this video, USGS scientist Larry Meinert describes how grapes, when supplied with too much water and nutrients can over-produce and result in mediocre wine. Unlike most gardening, the more stressed the grapes, the better they become for wine production. Wine-making grapes, like these Syrah (or Shiraz) grapes, require different growing conditions than grapes meant for eating. Cultivating wine grapes involves trying to concentrate sugars and encourage thicker skins, because these are what give wine its flavor. To do that, one of the most important factors to look for is the drainage of the soils. These grapes are grown on a greenstone schist formation in northern Maryland. To do that, one of the most important factors to look for is the drainage of the soils. Proper Soil Means the “Sauce” Won’t Spoil Soil chemistry and nutrients play a big role in the taste of the various hop and grape varieties. Soil drainage is an extremely important factor in the success of grape growing. The better the drainage, the more concentrated flavor can be in grapes and therefore the better the wine. Better drainage is usually found in loose soils where the water can flow away from the vines. When wine grapes have access to too much water, the sugars are diluted and the grapes grow too large, meaning the skins aren’t thick enough to provide proper flavor and color. Soil drainage can be studied either through geologic mapping or through remote sensing surveying, like 3DEP. The 3D Elevation Program (3DEP) initiative is being developed to respond to growing needs for high-quality topographic data and for a wide range of other three-dimensional representations of the Nation’s natural and constructed features through high-quality light detection and ranging (lidar). Diatomite: The Natural Filter Filtering is a key step to the beer and wine-making process. It is important to make sure that these beverages are clean and healthy. Luckily, the Earth has provided a natural filter in the process, a mineral called Diatomite, or diatomaceous earth, used in agriculture for grain storage as an anticaking agent, an insecticide, and as a natural de-wormer. Some farmers add it to their livestock and poultry feed to prevent the caking of feed. Diatomite is a chalk-like, soft, and very fine-grained sedimentary rock, usually light in color (white if pure, but usually gray, and rarely black). It is very finely porous, very low in density (floating on water at least until saturated), and essentially chemically inert in most liquids and gases. The principal use of diatomite is as a filter aid, an absorbent for industrial spills, and in toothpaste. It is also used as filler in a variety of products from paints to dry chemicals, and as insulation material. USGS tracks these uses as well as the supply and production of diatomite in its annual Mineral Commodity Summaries. Start with Science Amidst all the fun and festivities, there is still much to learn. USGS provides the science and information to understand the potential, production, and consumption of all minerals, water, and climate conditions in the wine and beer making process. So whether you’re celebrating Oktoberfest with a cold pumpkin-spiced beer or a glass of red wine, make sure to learn some science with every sip! In DreamWorks Pictures’ charming new film “The Hundred-Foot Journey,” Hassan (MANISH DAYAL, center) serves his father (OM PURI) Beef Bourguinon á la Hassan, a classic French dish with an Indian twist, as Madame Mallory (HELEN MIRREN) explains its significance to French chefs. Photo by Francois Duhamel, ©DreamWorks. All Rights Reserved. In every issue, we screen and review a film related to food. For our reviews on current feature films, check www.EdibleSA.com and sign up for the free Edible SA newsletter, which premieres in late August. Lasse Hallström (Chocolat) directed The Hundred Foot Journey, easily one of the best films of the year so far. The foodie film underscores the joys of cooking and absolutely showcases food as the universal language, with the power to tear people apart and, well, you’ll have to go see this magnificent film to learn more. Not happy about last night’s culinary presentation, Madame (Helen Mirren) compares great cuisine to a passionate love affair. The movie tells the story of a successful restaurateur family from Mumbai whose lives are turned upside down when tragedy strikes. To restart their lives, they decide to leave the land where their roots ran deep and travel through Europe to find a home. They are of course, the ultimate foodies, and their mission is to return to the culinary landscape where they are most likely to succeed again. Papa, played perfectly by Om Puri, decides the family will settle in a quaint town in the south of France. Madame Mallory, the not-so-welcoming neighbor, owns the Michelin-starred classical French restaurant across the street. And the battles begin. Helen Mirren gives a fabulous performance that could easily lead to another Oscar nomination, but there is no question that the entire cast was stellar, with perfect timing and chemistry, including the performances from actors Manish Dayal, the head chef for the Indian family and Om Puri, as Papa. Juliet Blake, Steven Spielberg and Oprah Winfrey produced this charming film that embodies cooking as an art, local and fresh foods, complimentary flavor sensations, modern techniques and the power of emotions while cooking. Add fabulous cinematography to the mix — and audiences will enjoy the bonus of being carried along the tranquil and bucolic scenery of southern France, giving all a moment to appreciate the farmers markets and fresh foods growing in the nearby pastures. Cultures collide, but Hassan Kadam (Manish Dayal) and Madame Mallory (Academy Award®-winner Helen Mirren) seek common ground through their love of cooking. Photo by François Duhamel, ©2014 DreamWorks II Distribution Co., LLC. All Rights Reserved. The movie runs about two hours and 30 minutes, but the time flew by. The entire staff agrees this is a must-see film for our readers. We were sad to see it end. Splurge and go enjoy “The Hundred Foot Journey,” which opens nationwide August 8. Every issue, we screen and review a film related to food. For our reviews on current feature films, check www.EdibleSA.com and sign up for the free Edible SA newsletter, which premieres in August. “And then I wrote this thing (I have a lot of really, really good 8-page scripts, by the way). I didn’t want to lose the scent, I was tracking it like a creature in the woods — and in less than a couple of weeks it was written,” he shared. After a couple of huge films (think Ironman), the friendly, easygoing filmmaker said the landscape is ripe for doing smaller films. “You can do smaller movies now again. I think that’s really good for all of us, because the big films have to appeal to everybody … to make its money back. But little ones like this, you can create for you and for an audience that will connect with it more personally, even if not everybody feels it,” he said. And he assembled a stellar cast to get the job done: John Leguizamo, Dustin Hoffman, Oliver Platt, Scarlett Johansson, Emjay Anthony, Robert Downey, Jr. and Bobby Cannavale. (A little trivia: NY Times food critic Andrew Platt is the brother of Oliver Platt, who plays the food critic). The plot is easy to swallow too – a chef is already a little estranged from his son, Percy (Emjay Anthony) because he’s always so busy. But when he lets the pressures of work and a well-meaning food critic (Oliver Platt) completely dominate his vista, he loses sight of what’s important and hits rock bottom. His evolution is the feel good part of the film, but there’s so much more. Part road trip, part drama, part comedy and commentary on the techno aspects of today’s society, Mr. Favreau succeeds in his endeavor. He created a terrific, light-hearted film that tells a story and shares the passion of the culinary world, from the inside out. You won’t find shoot-‘em-ups or explosions here. You will get to see a father-son relationship develop (kudos to the wonderful young Emjay Anthony for a great job), the inner workings of a professional kitchen and the mind of a chef, some pretty amazing dishes and how wonderful life can be when you just let it happen. Oh yeah, and remember to not to go see this film hungry, because you will suffer. We could almost smell the delicious meals and those Cubanos on the screen, thanks in no small part to Chef Roy Choi. Mr. Favreau wanted to depict the nitty-gritty side of being a well-known chef. So he roped in Chef Roy Choi, affectionately known as the king of food trucks in LA, to teach the cast everything they needed to know to make the film as real as possible. Chef Roy jumped right in as the culinary and technical advisor and put Mr. Favreau through an intense training period. Together, the duo created kitchen scenes that ring true, and will certainly resonate with many of our professional cooking friends. Chef Roy shared everything, from the proper choreography and etiquette in a professional kitchen to the proper knives to use and when. The degree of authenticity they achieved alone makes this film worth your time and trouble. And most important, the passion and dedication required to be successful in today’s culinary scene shines through. Note: There is a free online cookbook available with Chef Roy Choi’s recipes for the movie at www.bakespace.com, no need to sign up for free access to the book. Bonus tip: Make sure you stay for the credits, it will be worth your while. We rate this a must-see film for all foodies and anyone who enjoys a good film. And for those of you inspired to start your own truck … Ms. Lakendra Lewis will have all the information you need in the August/September issue! Also see page 53 in the June/July issue for the recipe to make the perfect Cubano sandwich.